Starin has launched the MIPRO MA505 portable battery operated wireless PA system. The MA505 runs on rechargeable internal batteries for 6 to 8 hours of life on a full charge, ideal for outdoor or other applications where an electrical outlet is not convenient. A built in wireless mic system, allows freedom of movement and flexibility for the user, along with either CD or MP3 player options to playback audio and additional wired or Bluetooth inputs. 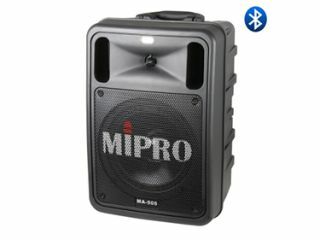 The MA505 is from MIPRO, one of the world’s leading manufacturers of wireless portable PA Systems. The two way speaker system has an 8” woofer and 1” titanium compression high frequency driver, powered by a 145 watt class-D amplifier. The package can accommodate two wireless mic systems and has a unique wireless retransmission module allowing the user to wirelessly send the audio to satellite MIPRO systems with wireless receivers. A convenient Bluetooth feature receives streaming from external players, smart phones or laptops. Additional wired mic and line inputs for hardwired sources complete the utility of the MA505. “MIPRO provides solutions for unique and special applications where sound reinforcement is required in places where a traditional PA just won’t work," said Starin MIPRO brand manager Joe Stopka. Suitable applications include – youth, collegiate and professional sports, parks and recreation, funeral and cemetery sites, political rallies, resorts, cruise ships, skiing facilities for competition and instruction, fitness instructors, golf clubs, haunted houses, missionary and house of worship, crowd control, political rallies, outdoor corporate events, school and playground activities, marching bands and more. MIPRO PA Systems are distributed in North America exclusively by Starin of Chesterton, IN. Starin is a distributor of AV integration products that generates demand for their brands via added-value measures of channel management, brand support, sales incentives, and procurement programs to make the job of the AV and IT professional easier and more profitable.